The following recipe has been translated and adapted from the original Dutch in Het Nederlands Bakboek and published on the Dutch Food site with the kind permission of the publisher. 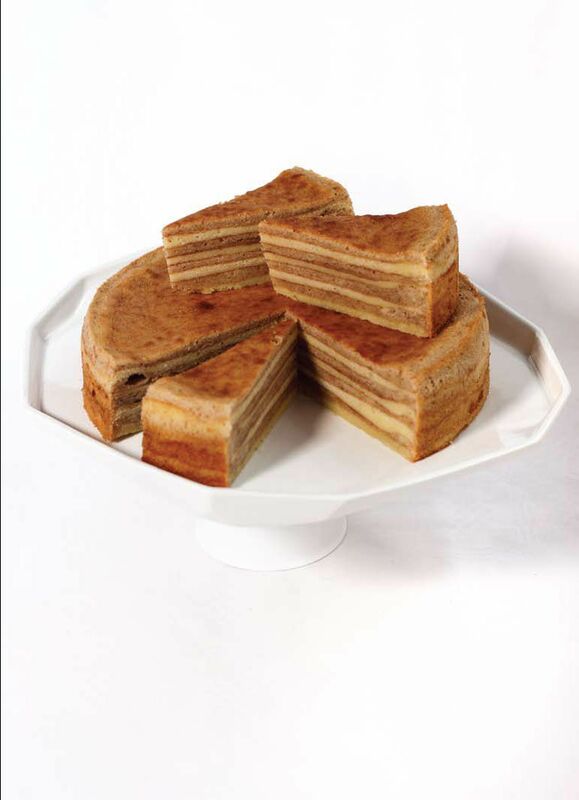 A delicious legacy of the former Dutch East Indies, traditional spekkoek, a layered spiced cake, is an extremely harmonious blend of Eastern and Western traditions. According to Het Nederlands Bakboek author Gaitri Pagrach-Chandra, recipes for spekkoek have long been appearing in Dutch cookbooks. In fact, Recepten van de Haagsche Kookschool (1899) features a recipe for spekkoek that is twice as large as the version described below. Spices were added with an extremely generous hand: the recipe uses a whole nutmeg and 65 cloves! You'll find many varieties of this cake in Asia today, ranging from versions with pandan leaf to tropical fruits, but the traditional spiced version remains popular in the Netherlands. Unlike most cakes, spekkoek is not prepared using conventional oven settings, but instead is made in a grill oven or under the grill. It is a labor of love, because each thin layer has to set before the next layer of batter can be added. These alternating layers of light and dark batter combine to create a striated cake, which looks a bit like streaky bacon (hence the Dutch name, which translates as 'bacon cake'). In Indonesia, the cake is known as spekkuk (a corruption of the Dutch name), but also as lapis legit or kue lapis. Give yourself plenty of time to make the cake. Even though this version only has a modest eight layers, it will still take between 45 minutes and 1 hour to complete. Rest assured that the effort is worth it: the recipe results in a rich cake, which can be served in small pieces and will keep well for up to a week if stored in a cool place. That leaves plenty of time to reap the rewards. Beat the butter until smooth, preferably with an electric hand- or stand mixer. Add half of sugar and beat until the mixture is light and fluffy. Add the egg yolks and vanilla extract and beat thoroughly. Whisk the egg whites in a spotless, grease-free bowl until light and frothy. Remember that the whisk should also be clean and free of the merest trace of grease, otherwise you will not get the desired volume from your egg whites. Gradually add the other half of the sugar to the foamy egg whites, while continuing to whip the egg whites slowly and steadily. Once you've added all the sugar, set the mixer setting higher and beat until the egg whites form stiff peaks that do not collapse when you pull out the whisk. Add a generous tablespoon of the egg whites to the butter mixture and mix well. Using a spatula, gently fold in one-third of the flour mixture into the butter batter, followed by a third of the remaining egg whites. Repeat twice, each time folding in a third of the flour mixture and then a third of the egg whites. Do not overmix; stop folding once the batter becomes uniform in color. Now place half of the batter into another bowl. Carefully but thoroughly whisk the spices into the batter of one of the bowls. Heat the grill until it's nice and hot. Grease the spring form pan. Using a plastic dough scraper, spread a quarter of the unspiced batter over the bottom of the pan, ensuring a flat, smooth layer. The batter should be evenly distributed, without thick or thin spots and the side of the mold should be kept clean. Place the spring form pan under the grill until the batter becomes puffed, golden and cooked. The first layer will take longer than the rest, because its slightly lower in the pan and therefore further from the heat source. It should take about 5 minutes to cook, but make sure the layer is cooked before adding the next layer of batter. Brush the top of the cake layer with melted butter and spread a quarter of the spiced batter on top. Again, spread the batter out evenly and smoothly, and place the pan back under the grill. Once this layer is cooked (after about 3 minutes), remove the pan from the oven and brush with butter. Again, spread a quarter of the unspiced batter over the cooked layer and keep repeating this process using contrasting layers of spiced and unspiced batter until all the batter and butter are used up. You should end up with eight cake layers with alternating light and dark colors. When the last layer has been cooked and removed from under the grill, carefully loosen the cake from the side of the spring form pan. Release the clamp of the spring form, remove the cake and allow to cool on a wire cooling rack. Once the cake has cooled down, wrap it up in a few layers of plastic wrap and store in a cool place outside the refrigerator. Serve spekkoek in thin slices. Try this Recipe for the Crunchiest Kletskoppen Cookies.